A man has been arrested after an incident at Estacada Harvest Market during which he attacked several people and stated he was suicidal. At 7:16 p.m. Sunday, March 17, several law enforcement agencies responded to a report that Rick Douglas Simmons, 19, of Estacada, was asking people at the store at 280 N. Broadway St. to call the police because he was suicidal. He was bleeding from cuts on his arms. Witnesses also reported that Simmons approached and shoved one woman before asking her to call the police. In the store's parking lot, he later punched a 71-year-old woman in the face and entered her truck in what appeared to be an attempt to steal it. Bystanders in the store's parking lot assisted the injured woman and stopped Simmons from leaving. During a struggle, Simmons drove the vehicle forward and hit a bottle return machine. Several people then removed him from the truck and held him down until police arrived. Simmons was placed in handcuffs without further incident. Police said he later admitted to taking hallucinogenic mushrooms. 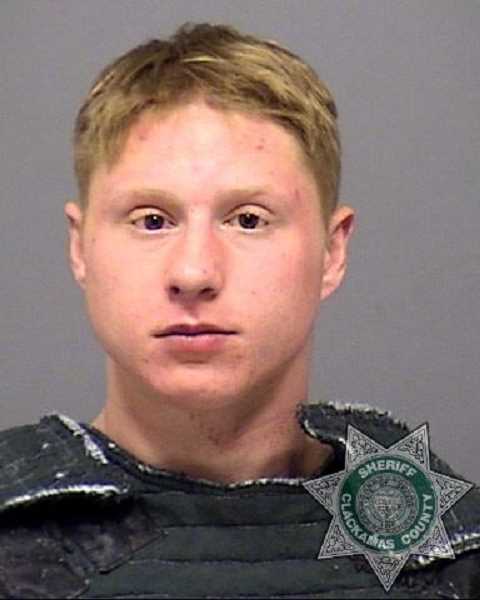 Simmons was booked into the Clackamas County Jail on $75,000 bail and accusations of third-degree assault, unlawful use of a motor vehicle, second-degree criminal mischief and reckless endangering. The Estacada Rural Fire District and American Medical Response provided the injured woman and Simmons with first aid. The victim received bumps and bruises but was able to leave with family members.